Back when I was little, my grandmother used to have a friend at her work who’s family would make tamales en masse at Christmas. She’d give her a few dozen and we got to feast on the little parcels of majesty for what I’d love to say was weeks after, but they barely lasted a few days. We had them steamed plain with nothing else to slow us down except for maybe some pinto beans or fluffy Spanish rice. 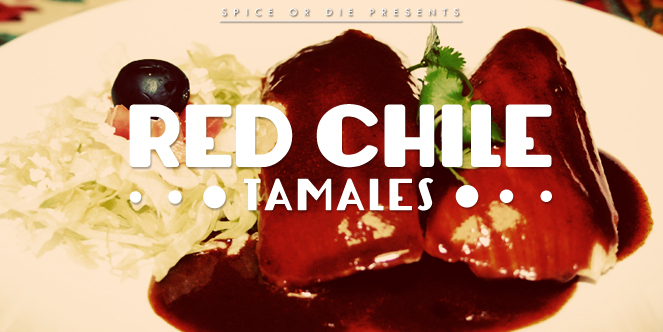 I’ve long been searching for a killer tamale recipe in the same way as I’ve wanted the PERFECT enchilada sauce recipe. I’ve gone through MANY iterations and variations of ones that come close, but I’ve yet to hit perfection. So of course, when I found out that this month’s Daring Kitchen competition was to make tamales, I was so excited to have the opportunity to get back in the lab and start tinkering again. I decided to try out a vegan dough using crisco and a traditional version using lard. I also went with a red chili enchilada sauce as the topper, along with a side of shredded lettuce, chopped tomato and black olives. As a means of speeding up the process, I used the pressure cooker to braise the chicken and beef, allowing me to make two savory fillings comprised of fall-off-the-bone tender proteins, all in the same day. The resulting tamales were a real treat, particularly given that there were not days of labor leading up to the best part…eating. I had read that you can actually steam your tamales in a pressure cooker in about 15 minutes. Has anybody ever tried this before? And was it a success? I’m excited to give it a go, but it’d be interesting to hear how it went for others. Until then, over and out from the tamale palace. Begin my making the filling of your choice. For the chicken filling, place the chicken breasts or thighs into the pressure cooker with the chicken stock, bay leaf, salt and pepper. Cook over high pressure for 15 minutes. Let come to pressure naturally and then take of the lid. Remove the skin and bones and shred the meat. Stir in the can of Ro-tel and taste for seasoning. For the beef filling, place the brisket, onion, garlic, bay leaves, chilies, salt, pepper and stock in the pressure cooker. Add enough water to cover and lock the lid. Cook for an hour on high pressure. Let the pressure fall naturally and then take off the lid. Use two forks to shred the meat, and add a little of the cooking liquid to the beef to moisten. Taste for seasoning, reseason and set aside. Grab a large pot with a lid, fill it with water and bring to a boil. Pop in the corn husks, cover the pot and let hang out for a half an hour or so. Corn husks are ready to go when they are pliable and easy to roll. Now to make your masa – in a standing mixer or with a bowl and an egg beater, cream your shortening or lard until light and fluffy. Add the masa harina, stock and salt and continue to beat until the mixture is creamy and soft. Assembly time! Grab a corn husk and using a butter knife or your fingers (get dirty! ), spread a few tablespoons of masa over the husk, making sure to leave at least a 1 inch border on all sides of the husk. Top the masa with the filling of your choosing and another tablespoon or two of masa to cover. 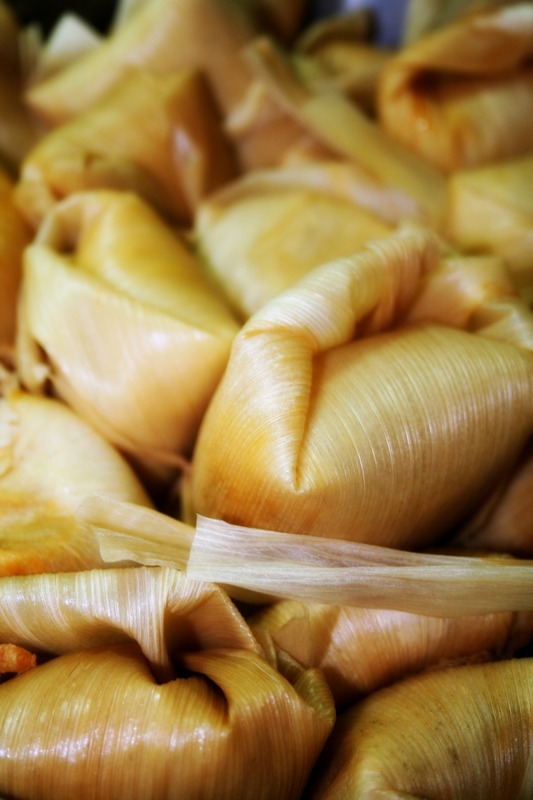 It doesn’t have to be pretty – the corn husk will smooth everything out when you steam the tamales. Roll the two sides of the cork husk to the middle and then the bottom side of the husk to the middle, forming a little package, You can leave the top end open. Grab a corn husk (I usually use a small or broken one) and tear off a length of it to make a 1/4 in. wide strip, like a little ribbon. Tie the ribbon around the folded tamale to keep it closed. Keep on filling tamales until you run out of masa. Set up a steamer and fill with enough water to barely touch the bottom of the basket. Line the bottom of the steamer with extra corn husks. Fill the steamer with the tamales and pop the lid on top. Cook the tamales over high heat for 60 minutes, occasionally checking to make sure that there is still water in the bottom of your steamer basket and adding more if necessary. While the tamales cook, make your enchilada sauce. Add the flour and oil to a sauce pan over medium heat and whisk to form a paste. Whisk in the chili powder, cumin, garlic powder and oregano. Lastly, whisk in the stock and continue to whisk until it thickens. Taste for salt and pepper and season. Set aside. Top with the red sauce and crumble a few teaspoons of cotija cheese over some shredded lettuce and diced tomato as a little side salad. What a great deep red color you have in that red sauce! Your tamales look wonderful and must have tasted awesome with that sauce on top. They were great, thank you! The sauce was *very* good, but if you can believe it, I am still on the quest for an enchilada sauce of my dreams. Also, the scene stealer of the plate was the crumbly, salty cotija cheese. Definitely not to miss. They look amazing and I love the idea of putting the enchilada sauce on top. I've been wanting to get a pressure cooker, and if you could cook tamales in them quickly, that might push me to get one. I'll wait for you to experiment on that! I adore my pressure cooker – being able to make authentic tasting risotto in 10 minutes total (5 minutes under pressure) and NO stirring pays for the thing all by itself. I would highly encourage you to pursue getting one – it's a marvel, and not at all scary. These look amazing! Good job. Thank you! They were SOOOOO fun to make! Nice! I heart all my FoodBuzz friends on here!